Peel and finely dice the onions and garlic. Wash, zest, and juice the lemon. Grate the Parmesan cheese and chop the chives and parsley. Wash the asparagus and broccoli. Peel the lower third of the asparagus stalks, then cut into bite-sized chunks. Break the broccoli into florets. Slice the button mushrooms. Heat some oil in a large pot and add the onions, garlic, asparagus, broccoli, mushrooms, and pasta, and season to taste with chili powder, salt, and pepper. Add water so that the ingredients are just covered. Cook for approx. 7 – 8 min. Add the frozen peas and cook for approx. 1 min. more. Drain two-thirds of the liquid. Add the heavy cream, lemon zest, lemon juice, and grated Parmesan cheese. Stir to combine and season to taste with salt and pepper. 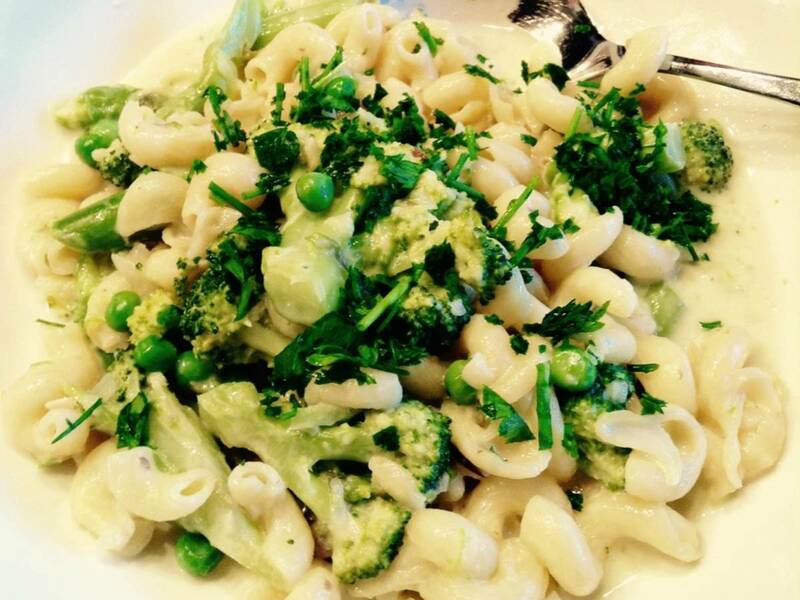 Garnish with fresh chopped parsley and chives, and enjoy!